SUR-FIT Natura Durahesive Skin Barrier with Flange is a comprehensive product line with our latest skin barrier technologies. The plastic coupling ring allows the pouch and skin barrier to snap together for audible security. Durahesive skin barriers are designed for people whose stoma output is mostly liquid. Unlike other skin barriers that can breakdown around liquid output, Durahesive® skin barriers swell up or "Turtleneck" to further protect the stoma and peristomal skin. 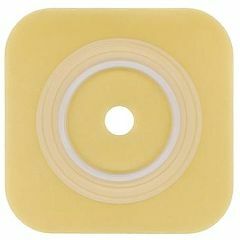 I use this to care for my ileostomy along with Stomahesive Paste and convex inserts.